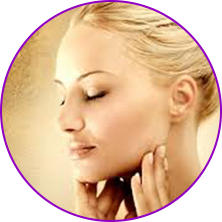 This 75-minute facial transports oxygen molecules directly into the skin to target multiple signs of fatigue and aging. Enhanced by our special formulation, the active ingredients in this facial enable moisture and nutrients to rejuvenate the skin at a deeper level than any standard treatment. The results include a reduction in the signs of aging and an instant boost of the skin’s youthful attributes. In addition to protecting against acne, inflammation and age spots, you’ll enjoy more firmness, elasticity, texture, softness and smoothness. Your skin will be deeply hydrated and nourished with a lasting, youthful glow. This 45-minute treatment features Ayurvedic techniques and botanicals that reduce skin inflammation, improve circulation and relieve tired muscles. Experience this powerful treatment specially formulated for the skin on your back. Relax and enjoy a reduction in pimples and the return of smooth, supple skin. Our unique 60-minute Diamond Facial is helpful for aging and problematic skin. Specially formulated to preserve the youthful qualities of the skin, this treatment combines diamond particles and date extract with the powerful properties of the ancient mineral Tankana. 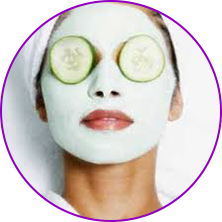 Toxins are extracted and the skin is newly purified. Cell regeneration is enhanced as new signs of aging are delayed. The skin is clean, refreshed, revitalized and rejuvenated. This 60-minute facial cleanses away blockages in the pores through a deep, yet gentle process. Our specially formulated cream and masque includes 24-carat gold particles that support the extraction of impurities and an increase in new cell production. Enhanced by a revolutionary mix of herbs, the results leave the skin fresh and radiant with a spectacular reduction in the depth of lines and wrinkles. 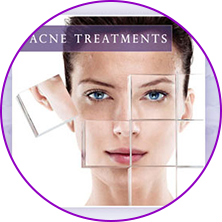 Our 60-minute Acne Treatment Facial has a unique formulation which rejuvenates dull, dry, denuded and wrinkled skin. Vital nutrients extracted from the ancient Neem tree provide powerful hydration and skin protection. In addition to controlling acne, freckles and microbial infections, this facial provides nutrition to depleted skin and will sooth problematic complexions. Ideal for a lunch hour and those on the go. 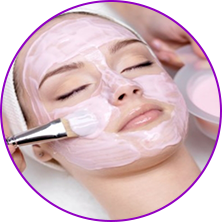 This 30-minute facial includes a deep cleaning followed by toning, exfoliation, hydration and treatment masque (extraction not included). This quick escape will leave your skin balanced and nourished. This 45-minute facial uses purely Ayurvedic ingredients including an effective combination of herbs and proteins and formulated to bring nutrition to the skin. 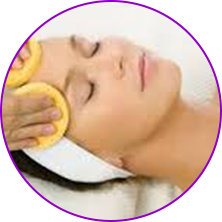 It begins with a deep cleansing and toning followed by an extraction massage and herbal masque. Dull, tired skin will feel refreshed, renewed and revitalized. Known to be a natural Ayurvedic skin brightener, pearls are rich in nutrients that help transfer melanin to the skin. Our 50-minute Pearl Facial aids in the fading of age spots and dark patches and features age-fighting proteins and nutrients to enhance moisture and elasticity. The result is fresher, brighter, youthful skin.